Carne asada is typically made with marinated grilled beef. With the Instant Pot pressure cooker, tender, flavorful carne asada is ready in just minutes! 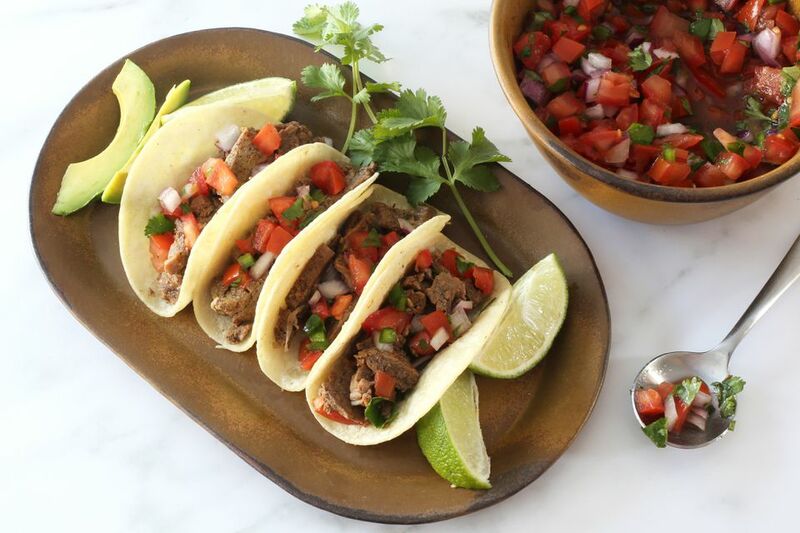 The beef makes fabulous street tacos with fresh salsa and your favorite toppings. You can also use the tender cooked steak in burritos, on nachos, or in quesadillas. Or make a rice bowl with a topping of carne asada and salsa. The included fresh pico de gallo salsa is the perfect topping for tacos, but feel free to use a commercial salsa, taco sauce, or plain diced tomatoes. For side dishes, consider Mexican rice, refried beans, and Mexican street corn. Slice the steak—across the grain—into strips. Peel the onion and cut it in half lengthwise. Slice half of the onion thinly. Chop the other half. Set the chopped onion aside for the salsa: juice one lime and the lemon. In a non-reactive bowl or the Instant Pot inner pot, combine the steak strips, sliced onion, and the lime and lemon juice. Add the chili powder, brown sugar, garlic powder, oregano, cumin, 3/4 teaspoon of salt, 1/2 teaspoon of black pepper, and the beef stock. If desired, add about 1/2 teaspoon of crushed red pepper flakes. Mix well and let stand at room temperature for 15 to 20 minutes or cover and refrigerate for up to 2 hours. Core and dice the plum tomatoes. Remove the stem and seeds from the jalapeno pepper and mince. Juice the two limes and chop the cilantro. In a medium bowl, combine the reserved chopped red onions with the tomatoes, jalapeno pepper, and cilantro. Add the lime juice from the two limes; toss to combine. Add kosher salt and pepper, to taste. Cover and refrigerate the pico de gallo until serving time. Put the marinated beef and marinade in the Instant Pot. Cover the pot and secure the lid. Make sure the steam release valve is turned to the sealing position. Choose manual or pressure cook, high pressure, and set the time for 6 minutes. When the time is up, allow natural release for 15 minutes. Carefully turn the steam release valve to venting to release the remaining pressure. Drain the beef. Assemble the tacos with corn or flour tortillas, beef, and pico de gallo salsa, along with shredded or crumbled cheese and slices of avocado, if using. Drink Suggestions: Mexican beer or sangria are excellent choices, or serve the carne asada with margaritas or a tequila sunrise.